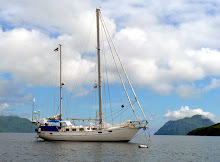 After motoring all the way from Dutch Harbor, the wind picked up as soon as we arrived at St. Paul late Wednesday afternoon, and it has been blowing since at the speed of 30 - 35 knots. Inside the fishing harbour, we found ourselves amidst tugboats and barges as the harbour is undergoing major construction. After somewhat confusing instructions as to where we should tie our boat, we were given a place alongside the Trident (Fish Processing Plant) dock. This is usually a good location since the laundry is normally close by, as was the case also here! The next day we took a tour of the town. 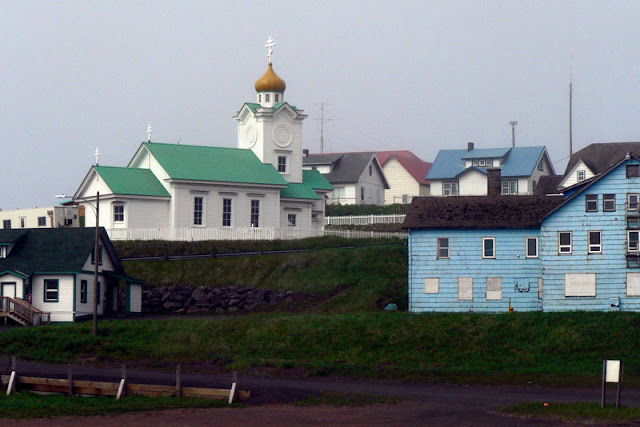 There are around 500 inhabitants on the island, most of whom live in the town of St. Paul. The community is predominantly Aleut (Unangan), with a small minority of Eskimos and Caucasians. 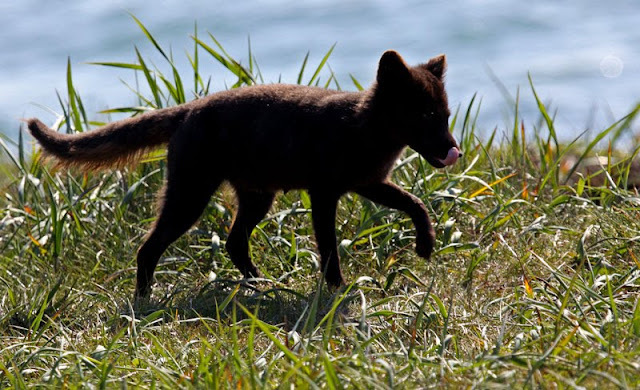 One of the very first local residents we met was, however, an Arctic or Pribilof fox (alopex lagopus pribilofensis) who, being an opportunist, resided next to the fishing harbour. Once again, one of our major concerns was how to update our blogs. At the Town Hall, we were told that there was no public internet access since both the hotel and the library were closed. But, we were free to use the computer at the Town Hall itself! In the afternoon, after the thick fog that had settled on the island during the night had momentarily lifted, we walked to the northern fur seal (callorhinus ursinus) rookery outside the town. Despite the 30 knot winds, going there was easy as we went along with the wind. But, coming back was a totally different matter. It was like being in a sand storm, you couldn't keep your eyes open and talking was out of the question unless you were prepared to get your mouth full of volcanic sand. We made it, however, and came back with loads of photos of the fur seals. At the rookery, we were a little apprehensive about the huge bulls that were lying alongside the path leading to the blind within which you have to remain while watching the seals. This is to protect the seals from any human disturbance. We knew that fur seals are aggressive animals and can run faster than people on most terrain, and that bulls, in particular, appear to regard the upright posture of humans as a threat. So, we proceeded with caution and stopped immediately when one of the bulls close by lifted himself up from the ground and started roaring. After a while, the bull seemed to relax, and we continued to the blind. The view from there was absolutely breathtaking! The whole beach was covered with fur seals; bulls, cows, newly born and older pups lying side by side or on top of each other in closely packed groups, some sound asleep, some arguing fiercely with their neighbours. 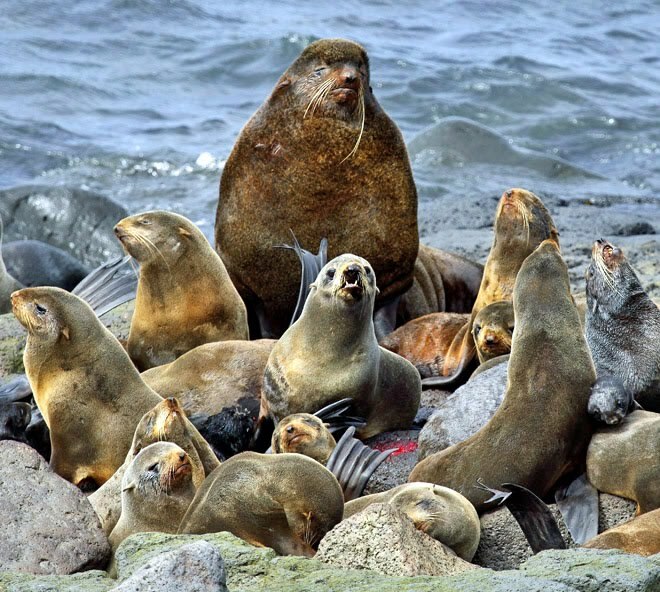 Seeing the thousands and thousands of fur seals, one could easily forget that the number of seals is actually declining. 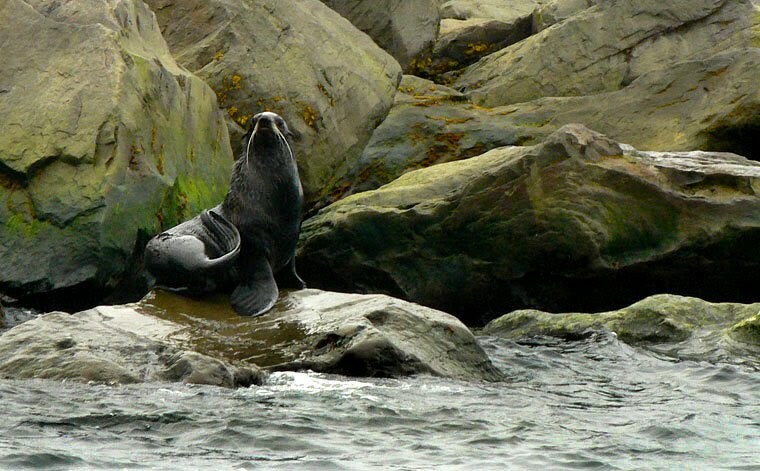 At the end of the 18th century, the Pribilof Islands' seal herd comprised 3 to 5 million animals. By 1911, the population had declined to about 200,000 seals due to hunting. The North Pacific Fur Seal Treaty, which was the very first international treaty for wildlife conservation, signed between the United States, Canada, Japan, and Russia, ended pelagic sealing and together with an Act of Congress approved in 1912 that prohibited the killing of fur seals anywhere within Alaska for five years, allowed the severely depleted fur seal populations to recover. Over 50 % of the world's population of northern fur seals breed on the shores of the Pribilof Islands. 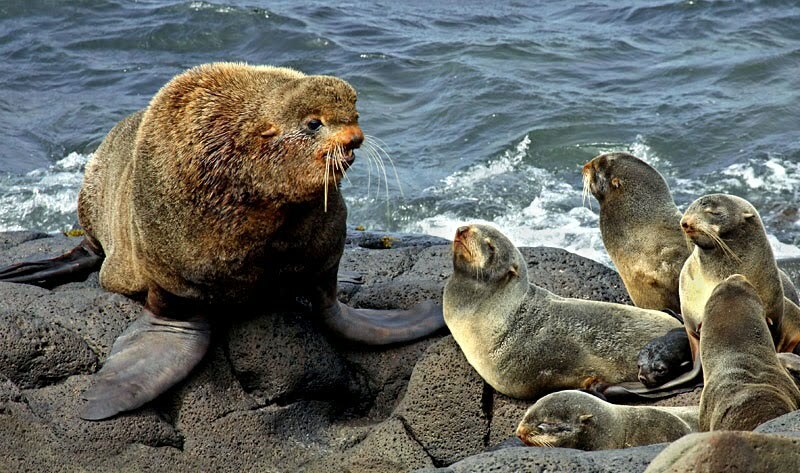 A study carried out in 2004, estimated the total number of fur seals on the Islands to be 625,000. However, the number of pups born on St. Paul that year was 15.7 % less than in 2002 and 22.6 % less than in 2000. The reason for this is not known. For us, this was probably once in a lifetime opportunity to watch northern fur seals at such close range, and so we stayed until our hands were so cold we could not take another picture!